Tired of waiting for your prescription? Looking for a pharmacy that cares about your health and wellness? 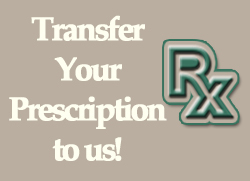 At Port Pharmacy, we will transfer your prescriptions for you from your current pharmacy and we’ll be ready to fill your prescriptions when you walk through the door! It’s simple – complete the information in the form below! Are you new to Port Pharmacy? You can save even more time by completing our New Patient Profile at home, print, and bring it with you to pick up your prescriptions. Already have a prescription on file at Port Pharmacy you would like to refill? Click Here to visit our Online Refill page! To Verify Your Submission, You Must Enter the Total of the Two Numbers Listed Above the Submit Button PRIOR to Submitting.